Our second Father’s Day here was as good as the first and better. We gave Dad some Looney Tunes golfing equipment, but the practice putter doesn’t work very well. Dad still loves it. After the celebration, we had eggs, sausage, and english muffins for breakfast. It was delicious. Then, we drove down to the Tahoe Gal for another ride. 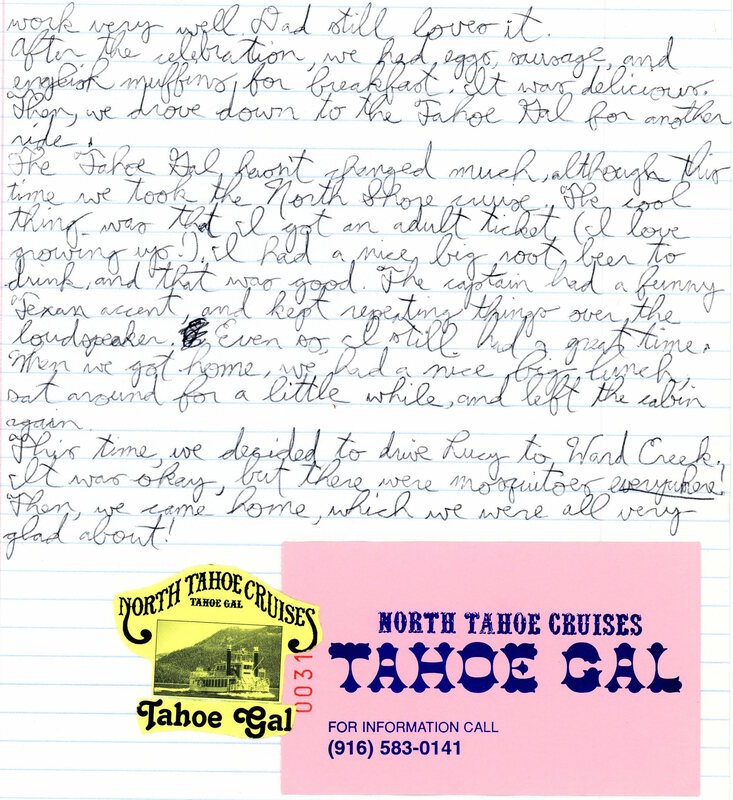 The Tahoe Gal hasn’t changed much, although this time we took the North Shore cruise. The cool thing was that I got an adult ticket (I love growing up!). I had a nice big root beer to drink, and that was good. The captain had a funny Texan accent, and kept repeating things over the loudspeaker. Even so, I still had a great time. When we got home, we had a nice big lunch, sat around for a little while, and left the cabin again. This time, we decided to drive Lucy to Ward Creek. It was okay, but there were mosquitoes everywhere! Then, we came home, which we were all very glad about!